I am going to consider this project complete. The enclosure and other future build plate designs will be on a new version which I'll make a new build for. I plan on doing a cleanup build to make install, mirror alignment, and general design quality better. The files are designed with laser cutters in mind, but could also be made with a 3d printer, cnc machine, or just out of sheetmetal. They are also setup to be made with 3mm acrylic, but in theory you could make them out of thicker material. I would not recommend making them from anything thinner than 3mm. Glue all the brackets together using some hot glue, or super glue. The second mirror plate requires the one of the side gantry plates to be removed for install. It is easiest to do this now before assembly so we don’t forget. I used some M5x 20mm low profile bolts with the head of it facing towards side where the aluminum extrusion will be. Tighten it enough that it slides with some force, but not easy to move. You have to remove the gantry to adjust these later so getting them correct now is important. I highly recommend drag chain, as there are a lot wires that could get burnt if they get caught in something and cross the laser path. 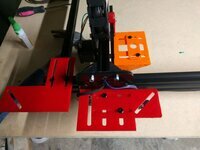 Using two M5x8mm bolts and t-slot nuts on each bracket attach the brackets to the aluminum extrusion. Set the laser tube in the bracket on top of some rubber pads. I used the pads that were in the K40 already. Adjust the tube to be close to level and have the laser fire a few cm over the top of where the 2040 will be. Bolting on the rest of the conversion pieces requires a bunch of M5x8mm, m5x10mm, standard nuts and washers, and some t-slot nuts. Otherwise bolting these on is pretty straight forward. I am running a xpro cnc driver on my machine. To get PWM to power the laser you need to change some software and hardware. The biggest problem you will run into is 5V is 0% output power and 0V is 100% power. This causes issues because if we flip it in software when the arduino boots it will fire the laser 100%. I flipped it using a simple mosfet circuit. GitHub - McNugget6750/K40-grbl-board: A direct exchange board for the cheap Chinese moshi board using a custom single sided (with some bridges at the top) board and pololu drivers. #define INVERT_SPINDLE_ENABLE_PIN // Default disabled. Uncomment to enable. Enable variable spindle speed this gives you hardware PWM on Pin D11. #define USE_SPINDLE_DIR_AS_ENABLE_PIN // Default disabled. Uncomment to enable. I plan on using the enable pin in the future, and I might flip it back to normal so I can flip a relay. Right now this is quite messy, but fully functional. I plan on cleaning this up once I get the enclosure built. I used this guide which made aligning the mirrors very easy. Which is good because I had to realign these a lot while I changed bracket designs! I used the standard grbl settings that openbuilds provides. You also have to add the command “M4” under gcode start in the settings. This will enable the laser in GRBL. STEP 8: MAKE SOME STUFF! I currently use inkscape to design the svg code before importing them into laserweb4. There are plenty of great tutorials on how to use both these programs online. Cut all the proper plates and made the build guide. Caught up on all the orders I'm behind on with my shop. This laser works so much better than a stock K40! Realized that my laser had has to move down to be able to get into focus. Redesigned the first mirror bracket and the laser tube holder. Cut these really crappily using an out of focus laser. Basically charred wood in a close shape and just sculpted it into a general shape. Good enough to make it focus and then re-cut proper plates. My main goals for this project are now complete. I don't have my enclosure built, and I the brackets really need to be tweaked slightly, but overall this project was a huge success! I will be writing a build guide tomorrow, but for now, here is a quick sneak peak! Big night tonight. Tore into the K40, and ripped all the guts out of it. 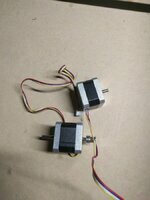 Was surprised to see the stepper motors were different sizes. This really concerns me, as they will be running in parallel to power the y-axis. Once wired up and setup in the GRBL settings they appear to be working correctly though! I also got the tube and power supply moved over to my super janky tube holder setup. I am REALY not a fan of these, so I will probably implement the stock K40 ones at some point, or beef these ones up a lot, otherwise they will probably work well enough to allow me to laser cut new ones. Now I just need to figure out how to wire the laser to fire when I tell it to. I should be able to follow any GRBL style conversion, which there are plenty out there. Did all the boring stuff, such as wiring outlets and whatnot today. Pulled a few more cables through the drag chain which is now completely full! Started wiring outlets and other additional items to get this project powered. Also laser cut the laser head mount and bolted that to the carriage. I have a few other projects I have to get done with the laser before I can gut the K40. Hopefully that happens soon. Initial gantry setup built, laser cut all pieces but the laser head mount. 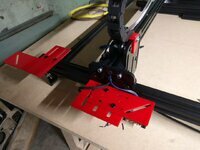 I currently have the x-axis wired up and moving, but I am waiting until I tear into the k40 to do the rest. 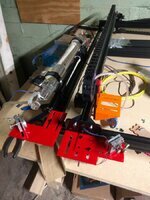 the y-axis stepper motors, laser tube, laser power supply, mirrors and lense will all be stolen off that machine. I also do not have the laser head bracket cut yet, but it is designed. All my files are on another machine but I will include them soon. 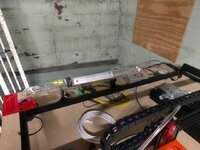 To start, if you haven't heard of a K40, it is a cheap ($360) 40 watt co2 laser cutter. It requires a few extra things to make it worthwhile as a laser cutter, but I have $500 in mine and am extremely pleased with how well it preforms. The only issue I have with it as of right now is the work area, which is about 12"x8". I started this build because I wanted to upgrade the work area of my k40. I initially thought about keeping it within my k40 enclosure, but decided that if I am going to upgrade the size of the machine I am going BIG. I saw the ACRO when researching and thought this was a perfect combination of challenging my self to designing the rest of the build. I set a few challenges for myself as well. 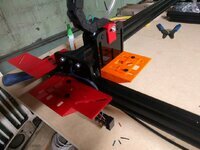 I wanted to use all the original ACRO plates, minus the Z-axis adjustment plate, as well as build a nice enclosure. Luckily, the ACRO plates have a bunch of extra holes cut in them to mount all the extra plates I need to mount mirrors and the laser head. Step 1: Mount the conversion brackets to the ACRO plates. Some of these require you bolting into gantry plates that are already installed. It is easier to do this before they are bolted onto the rest of the gantry system. Step 2: Build the ACRO system. I am not going to go into this, as there is a great build video for this already posted by the openbuilds team. Step 4: Install Tube, laser power supply, laser head and mirrors. Connect laser power supply into stepper driver's pwm output. Step 5: Assemble enclosure Design not complete yet. Tom Sanders, Mitch Newstadt, Wildabeast and 9 others like this. I have a k40 laser cutter, but was getting tired of the limited space. 1 K40 Laser Cutter https://www.ebay.com/p/Upgraded-40w-Co2-Laser-Engraver-Cu...	Link	 Any of the 40 watt laser cutters on Ebay will work, they are all about the same. 1 3mm Acrylic Link	 12"x16" Should be plenty, can use the K40 to laser cut these out! 1 Nema 17 Stepper motor http://openbuildspartstore.com/nema-17-stepper-motor/	Link	 I bought a cheap one off Ebay, but this one is definitely higher quality. 1 Stepper Driver Link	 I used the xpro, but RAMPs is also commonly used.